Victoria Van Vlear, editor of American Farmhouse Style, shares her 5 tips for integrating farmhouse style into your romantic home. Farmhouse style is a hot décor trend, and for good reason. It’s warm and welcoming, comfortable and cozy, family friendly and laid back. And there’s no reason why your romantic home can’t gain some rustic vibes to freshen up your spaces and bring you a little closer to the country. Here are five elements that will add instant farmhouse appeal to your home. Mudrooms are practical in areas that get a lot of snow in the winter (and mud in the spring). These locations also tend to be in farm country, which makes a mudroom ideal for a farmhouse. The great part about a mudroom is that you don’t have to have a full room. You can create a mudroom space in an open foyer or in your entry hall. 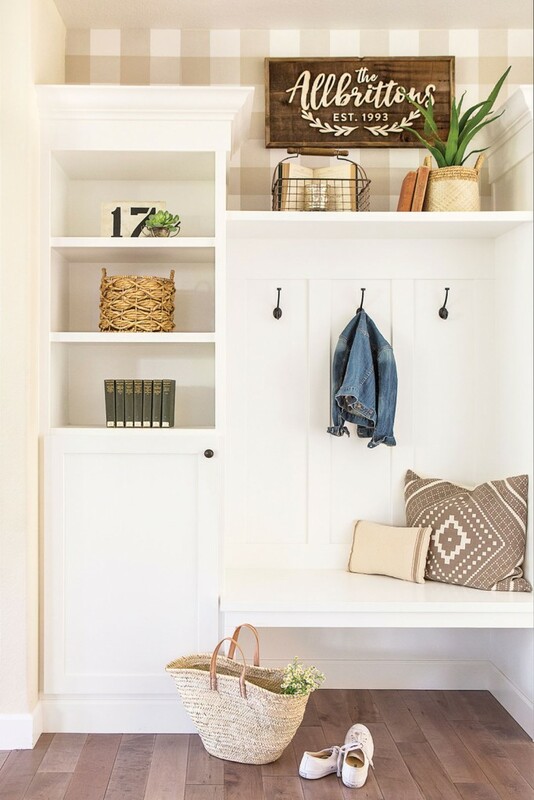 Janna of Yellow Prairie Interiors created a mudroom in her hallway with a simple built-in that contains a few coat hooks, a bench for putting on shoes and a closed cabinet for storage. 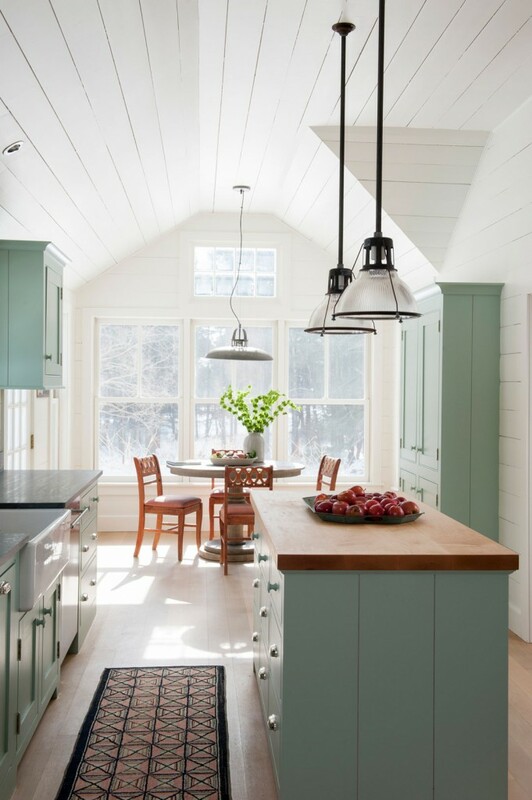 Many farmhouse lovers are embracing butcher block countertops in the kitchen. They’re affordable, DIY-friendly and convenient for chopping and other food preparation. And you don’t have to replace all your countertops in order to get the full farmhouse experience. Architect Rafe Churchill added butcher block to just the island, which is also the main food prep surface in this kitchen. This gives the homeowners a great base of operations, while still maintaining the high quality look of their other counters. 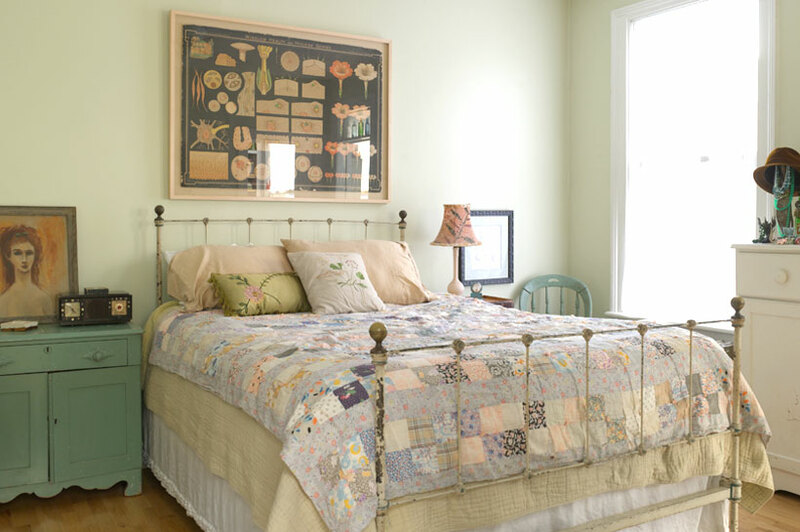 Farmhouse enthusiasts love to include rustic vintage items to their homes. 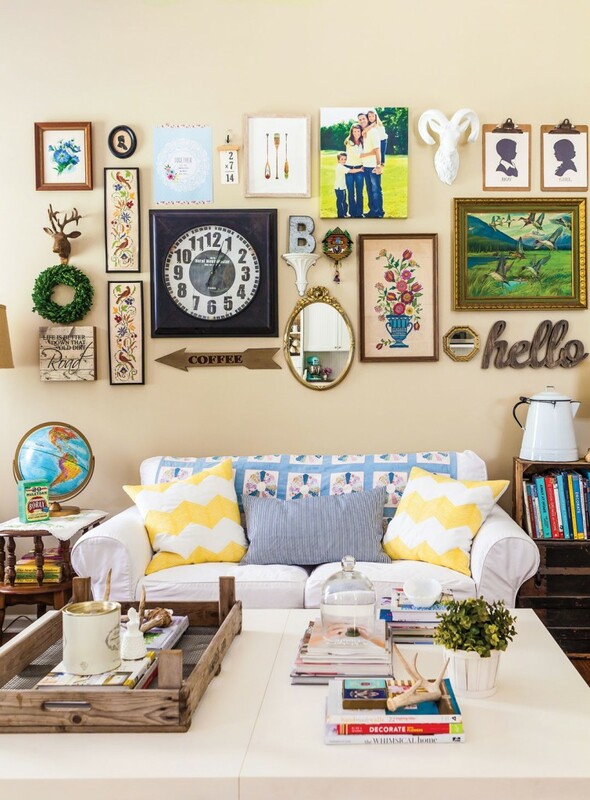 Head out to the flea market and bring home whatever catches your fancy—whether it’s a fruit crate you can turn into a bookshelf, framed needlework you can hang on your wall or an old quilt you can throw across the back of your sofa. 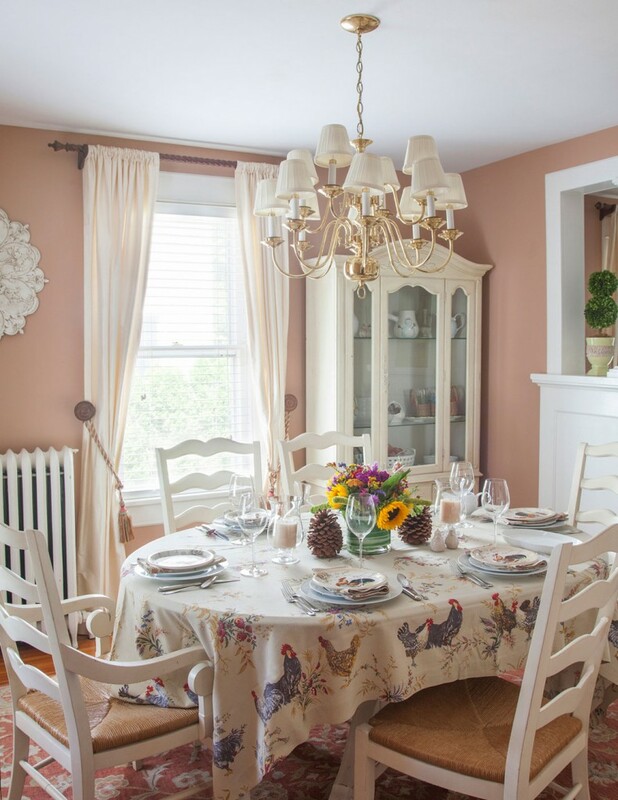 Flea market and antiques store items bring endless possibilities to your spaces, like they did for Katie of The Rustic Boxwood in her living room. You get bonus points if the item was made in America. The first pioneers in America were farmers, taking their families out into the wilderness to head West and carve a place for themselves (think Little House on the Prairie). Folks couldn’t afford fancy furniture, and most of it was whatever they could make with their own hands when they weren’t clearing the land or working the fields. 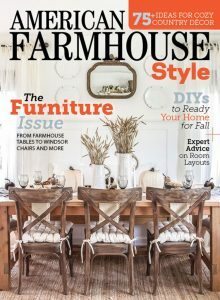 As a result, farmhouse furniture has remained simple—chairs with ladder backs, rustic farmhouse tables and three-legged stools. Infuse your own home with this same simplicity to keep the farmhouse spirit alive. Wood is a staple element in farmhouse style. 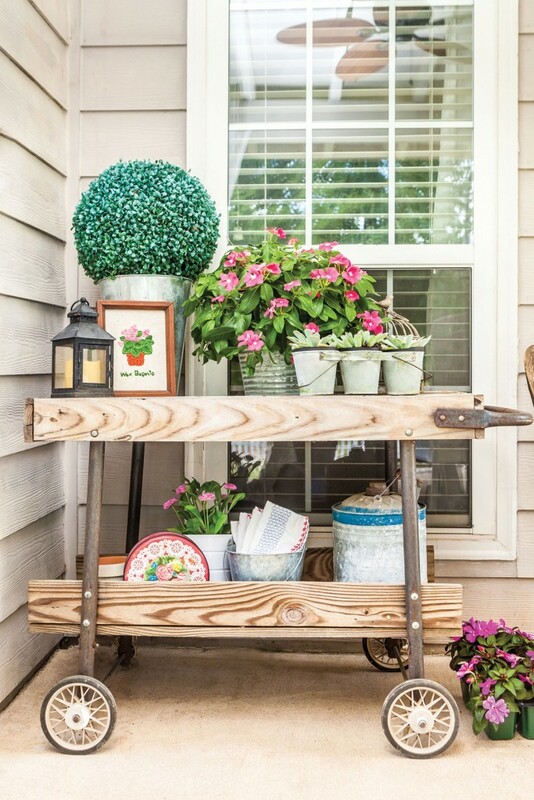 You can use it in myriad ways: on the wall in the form of shiplap or pegboard, in furniture with a farmhouse table, painted hutch or rustic bar cart, like this one by Katie. It’s also a great DIY material—try making a coffee table out of an old pallet, or stain a wood sign to become wall art with an inspiring quote. Love the rustic simplicity and homegrown comforts of the farmhouse style? You can find more inspiration for your farmhouse by subscribing to American Farmhouse Style. You can also follow on Facebook and Instagram.